I’m almost 32 years old (turning the big three-two April 3rd if you want to flood my Facebook with birthday wishes) and I’ve been a horror fan for as long as I can remember yet I’ve never been to a horror con until now. This past Friday I rectified that blaring omission from my horror fan resume and made the trek from Bowling Green, OH to the beautiful city of Cincinnati, home of my beloved Bengals, the Cincinnati Reds, Samhain Publications (apparently, I had no idea), and the great people of Night of the Living Podcast. Drive time: 3 hours. Time spent waiting in line: 3-1/2 hours. Cost of a Friday day pass: $25. So, for a six hour round trip and a line stretching back to Dayton you may wonder what all the fuss is about. For thousands of women with hearts in their eyes there was Norman Reedus, a.k.a. Daryl Dixon from The Walking Dead, signing autographs and taking pictures. There was also some dude named John Carpenter. For horror lit fans like us there was Samhain Horror up front and center with a few authors on hand to chat with readers and sell great horror fiction. At the Samhain booth were Jonathan Jaz – the Samhain author I am most familiar with having read both The Sorrows (review here) and House of Skin (review coming soon) – Brian Moreland and Kristopher Rufty, both authors whose work I am anxious to get better acquainted with. Besides Elizabeth Massie at the premier of Abed – the short film by Ryan Lieske based on Massie’s short story by the same name – I have never met an author in real life! Still, all the interactions I have with horror writers online are exceptionally pleasant. They’re always passionate about their craft, willing to share that excitement for the genre with fans, and characterized by a humble and friendly disposition that strongly contrasts with the baddies in their stories. 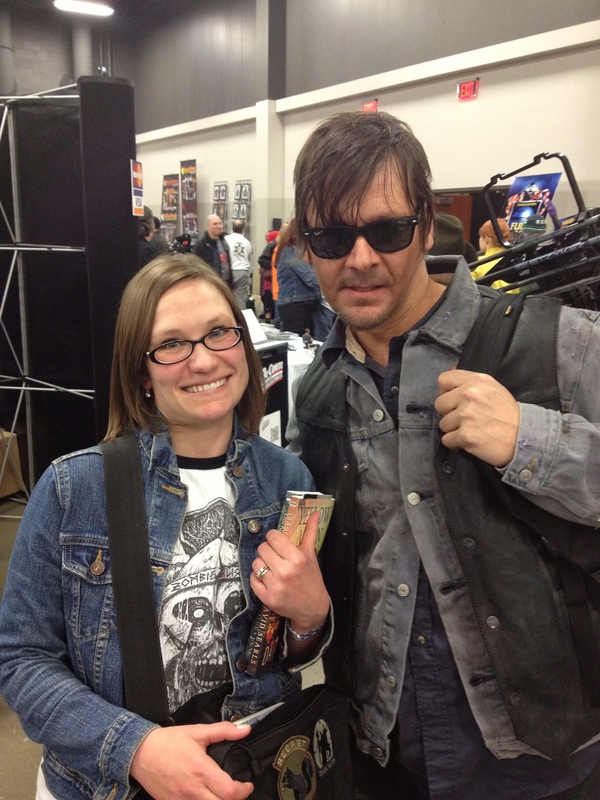 I didn’t get a photo with just Janz and I, but I got a photo with the Daryl lookalike. Check out me cheesing! Meeting these three Samhain authors face-to-face was just as thrilling as corresponding with them virtually and left me feeling completely reinvigorated with a passion for this small but growing community. In this horror microcosm you can boil it down even further to the very specific part of the genre you love most. For many it is film, for others it may be art, fashion, sculptures, toys, or music and for me (as well as my new friends Erin from Oh, for the HOOK of a BOOK! and Tim) it’s horror fiction. The opportunity to be a freak among like-minded freaks was overwhelming. I had no idea what I was missing. Not only did I make a bunch of new friends, I was struck by how hard these authors work. Their love for the genre and the fans of their work is unparalleled. While they may not have the glitz and glamour of a crossbow bearing zombie killer, these are my rockstars. As I mentioned, I am most familiar with Jonathan Janz’ work and was excited to meet him in person after corresponding via the internet for more than a year now. His debut novel from Samhain, The Sorrows, offers an impressive introduction to his work and the man couldn’t be any more grateful to his fans. Standing at 6’4” Jon is a gentle giant that chatted excitedly with fans about horror and worked diligently to spread the good word for his fellow authors as well. He is a fanboy just like you and me – hell, they all are! 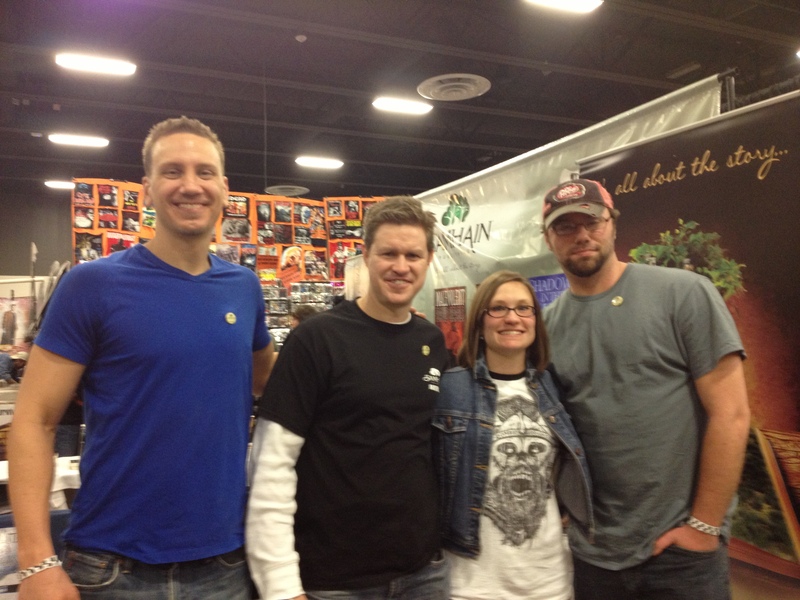 – even trying to suppress the urge to chase down a Daryl Dixon lookalike for a photo op. The Darkest Lullaby out April 2013! I remember when I wrote the review for Janz’ The Sorrows I boldly stated that “You shall know thy name Jonathan Janz!” With a growing fanbase and a number of projects lined up for twenty-thirteen, I can stand confidently by that statement. There is a 5 part serialized novel Savage Species, the first installment will be released 6/4/2013 with the subsequent 4 entries coming out in bi-weekly increments. 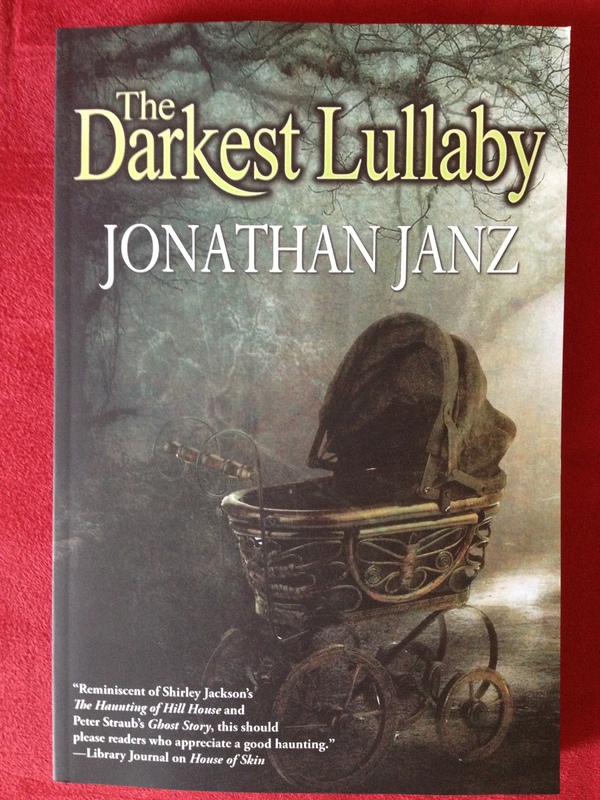 The Darkest Lullaby will be out 4/2/2013, but you can pre-order the eBook for only $3.85 here. I picked up a tpb copy at the con and I can’t wait to check it out. We can also expect Dust Devils (western meets vampires! ), no release date that I know of yet, and possible sequels to earlier work. If you haven’t read his stuff yet, you gotta gotta gotta! You can look him up on the Samhain website or check him out at http://jonathanjanz.com/, follow him on Facebook, and Twitter. Me, Brian Moreland, and my signed copy of Dead of Winter. Success! 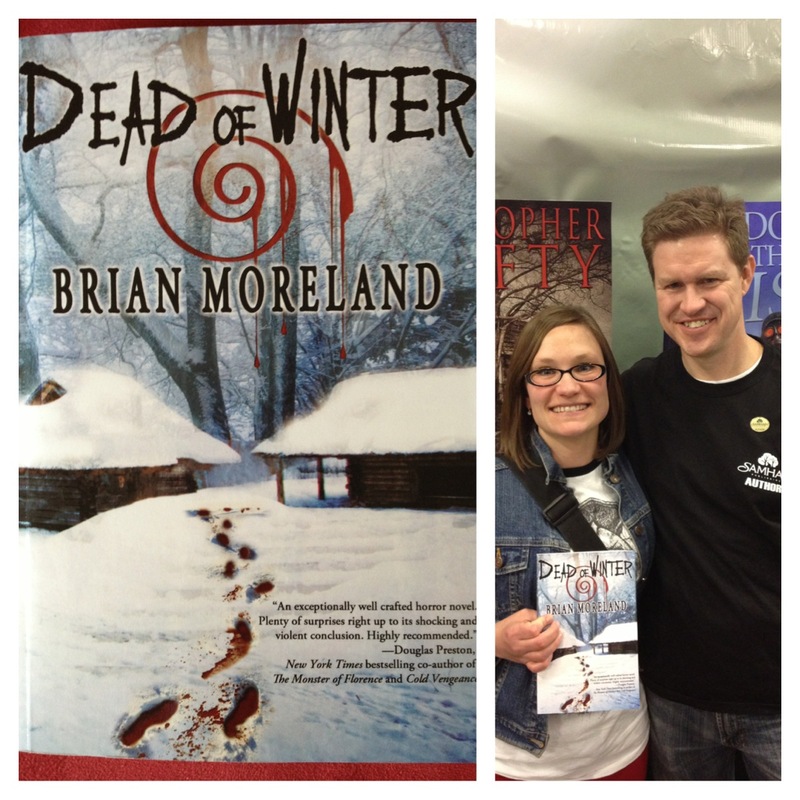 I also met Brian Moreland, author of Shadows in the Midst and Dead of Winter. While I haven’t read his work yet, I picked up a copy of Dead of Winter per Moreland’s recommendation. We talked a bit about written horror versus horror film and it turns out he studied screenwriting but shifted his attention to novels to avoid the obvious constraints of making movies – budget requirements for effects, etc. Moreland traveled the furthest to HorrorHound Cincy making his way from the state where everything is bigger and better, Texas! Like Janz, Moreland too will be having a busy year at Samhain with a short called “The Girl from the Blood Coven” coming out the first week in July 2013, a novella called The Witch House to be released in early August 2013, and the novel The Devil’s Woods coming out in December so be on the lookout for those. As I mentioned, I haven’t read his work yet, but based on our discussion I would expect cinematic writing with historical underpinnings. Find Brian Moreland via Samhain, or his website http://www.brianmoreland.com/ and follow him on Facebook and Twitter. Rufty, me, and his better half Angie. Below that are my signed copies of PillowFace and his movie Psycho Holocaust. Last but certainly not least, I met Kristopher Rufty who was there with his lovely wife Angie. With the second longest commute after Moreland from Texas, Kristopher and Angie made the trek from North Carolina, about an 8 hour drive. Still, they came fresh faced and wide eyed ready to meet fans and at other times be fans. Rufty has written a number of titles available. His short “The Night Everything Changed” is available for free at Samhain here, and you can pick up Angel Board, The Lurkers, and A Dark Autumn from Samhain as well. His next novel Oak Hollow will be out August 2013. 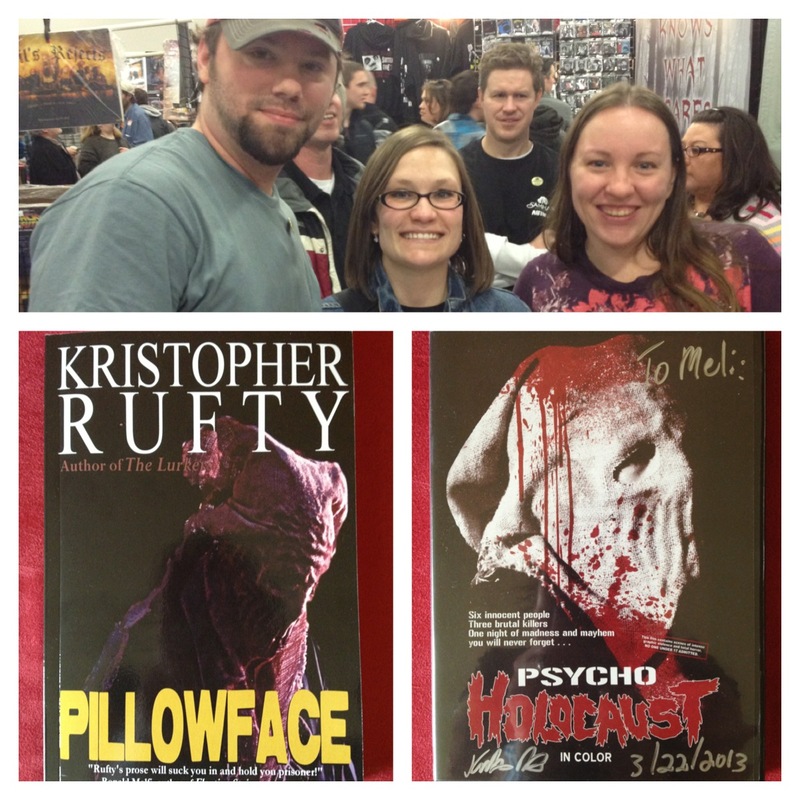 Rufty had advance copies of Oak Hollow for sale at HorrorHound, but I opted for a copy of PillowFace (Lazarus Press) along with his film Psycho Holocaust instead. The killer in PillowFace is drawn from a psycho of the same name in Rufty’s movie so I had to have them both. Something about the Texas Chainsaw Massacre inspired pulp fiction that I was drawn to. When I got home from HorrorHound Friday night at about 2am I immediately popped my copy of Psycho Holocaust into my DVD player, cracked open a beer and braced myself for the mayhem. As Rufty put it before we parted ways, “It’s super violent and super low budget.” That’s an apt description, but I think the movie deserves more credit, so I will save my thoughts for the Dreadful Tales review. I will tell you that after all the excitement of my day I fully expected to pass out 5 minutes in, but I just couldn’t stop watching. Based on the depravity I witnesssed in Psycho Holocaust, I have high expectations for his horror fiction where he has an unlimited budget for practical effects that depend on the reader’s own imagination. To follow Rufty in his book writing / filmmaking adventures you can find him on the Samhain website, his blog Last Krist on the Left (pretty clever, huh), Twitter and Facebook. While the time spent at HorrorHound was short, it was certainly sweet. It was great to meet everyone in person and make new friends in the process. Thanks to Samhain and their authors for not only making great horror fiction but going out of their way to connect with fans. Don Henley has The Boys of Summer, but I got The Boys of Samhain. This entry was posted in Authors, Events and tagged Brian Moreland, Jonathan Janz, Kristopher Rufty, Samhain Horror by Meli Yoroshiku. Bookmark the permalink. What a fantastic, article, Meli. I’m so thankful to know you, and meeting you was just a blast. Hopefully this will be the first of many convention hang-outs. You and Dreadful Tales are awesome! Happy Birthday, Meli. Congrats on reaching the big 32.